Your smile is a central component of your overall appearance. A dazzling smile can make you feel more confident and attractive. Patients who want to create a brilliant smile often ask Dr. Sledd how to whiten teeth fast. Professional teeth whitening is the most reliable and safe way to whiten teeth quickly. While over-the-counter kits may seem like an easy way to brighten teeth, you may not be satisfied with your results. Store-bought whitening kits are convenient, but they only whiten teeth a few shades. Most importantly, store-bought kits are one-size-fits-all and not customized to give you a safe and effective whitening experience. Dr. Sledd provides better ways to brighten your smile. To learn more about how to whiten teeth fast, read on below. In-office tooth whitening is often the fastest route to a bright, white smile. Patients can take a break in our comfortable dental environment while Dr. Sledd provides a flawless whitening procedure. Our staff will make sure that you experience minimal sensitivity while transforming your teeth. After just one hour in our office, you can leave with a movie star smile! Teeth whitening at home is preferred by many patients. You may love the ease of whitening while you sit back and relax, or continue daily tasks without interruption. Dr. Sledd can provide you with a professional teeth whitening kit so that you can enjoy stunning results in the comfort of your home. For many years we offered Zoom Whitening products. Zoom has become very popular and many people ask for it by name. This does not mean it is the best option to whiten your teeth. We have chosen to move to the breakthrough professional technology of KöR and GLO products instead. Some of the strongest reasons we decided to stop offering Zoom Whitening are because both GLO and KöR provide better results for our patients and cause fewer sensitivity issues. In addition, the Zoom Whitening process takes longer to achieve white teeth. Zoom Whitening requires 2 hours in the office. That’s double the time you need to spend at the dentist for a GLO Whitening treatment. Even the at-home time takes longer with Zoom. GLO Whitening products have high concentrations of powerful whitening ingredients and a light-powered tray. This whitening treatment utilizes an innovative personal teeth whitening device that provides a one-of-a-kind, closed-mouth, whitening system. You can see dramatic results with GLO after just one hour in the office and 32 minutes at home. Patients love GLO because it is so easy to use and the treatment plans can accommodate busy schedules. With a zero-sensitivity tooth whitening agent and guided light optic technology, GLO Whitening is efficient, effective, comfortable. 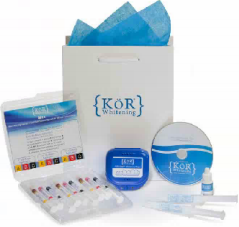 KöR produces high-quality products for effective teeth whitening at home or in-office. Patients who opt for the in-office procedure can watch television, listen to music, or take a nap. It is the only whitening system in the world that is constantly refrigerated to ensure total freshness and optimal power. You may be surprised by the affordability and convenience of your whitening options with Dr. Sledd. Call us at Arbor Lakes Dental today in the Minneapolis suburb of Maple Grove to schedule your KöR or GLO teeth whitening treatment. We can’t wait until you dazzle the world with your brand new smile if you’re from the Champlin – Brooklyn Park, MN area!